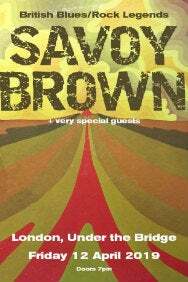 We do not curently have theatre tickets available for Savoy Brown. This could be because we have simply sold out or it could be that this show is no longer running. The information on this page remains purely for historical and informational purposes. One of the earliest of British blues bands, Savoy Brown, with founder guitarist Kim Simmonds at the helm were a major part of the UK blues boom movement. Savoy Brown released their debut album "Shake Down" in 1967. Finding success in the USA, Kim Simmonds enlisted Stan Webb and members of Chicken Shack to join the group in 1971 after most of the original band left to form Foghat. Savoy Brown have headlined NYC's Carnegie Hall, LA's Fillmore East and West and have cemented their name as one of the important British Blues bands of all time alongside Fleetwood Mac/Peter Green, The Yardbirds, John Mayall's Bluesbreakers, Ten Years After, and The Animals.